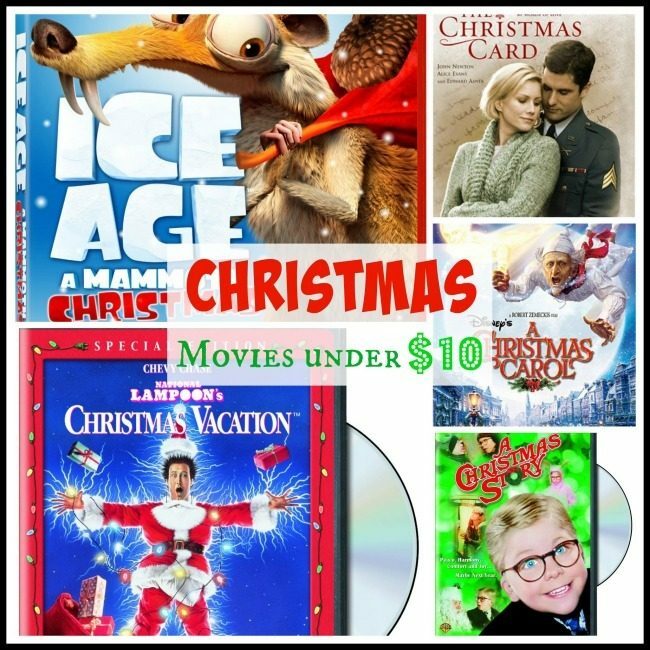 10 Christmas Movies Under $10! You are here: Home / Great Deals / Amazon Deals / 10 Christmas Movies Under $10! The Christmas season is upon us, and it’s the time of year when I love watching Christmas movies! If you’re looking for some new movies to watch on your own or with the family, we have a list of 10 Christmas Movies Under $10 for you! The Christmas Card – $4.88 + FREE shipping! Ice Age: A Mammoth Christmas Special – $5.09 + FREE shipping! Little House on Prairie: Merry Ingalls Christmas – $5.79 + FREE shipping! The Christmas Pageant – $5.98 + FREE shipping! Trading Christmas – $5.99 + FREE shipping! Disney’s A Christmas Carol – $8.70 + FREE shipping! National Lampoon’s Christmas Vacation – $8.96 + FREE shipping! A Christmas Story – $8.96 + FREE shipping! Hallmark Holiday Collection Movie 4 Pack – $8.99 + FREE shipping! Disney’s Sing Along Songs – Very Merry Christmas Songs – $9.96 + FREE shipping!